The Hit Men will perform in New Bremen, April 7. NEW BREMEN — True to the name of their latest album, “Don’t Stop,” the Hit Men, classic rock’s unique supergroup of legendary side men, are back on the road this year to launch their 2019 U.S. tour aimed at delivering even more of the hits they first played with the original superstars, with additional classics emerging in their shows as the tour marches on. The Hit Men will perform a Lock One Community Arts concert, April 7, at 3 p.m. in the James F. Dicke auditorium of New Bremen High School, 901 E. Monroe St., New Bremen. Tickets cost $30 for adults, $10 for students, and are available at 567-356-2048. After decades performing or recording with classic rock superstars Paul McCartney, Elton John, Rod Stewart, Mick Jagger, Carly Simon, Cat Stevens, David Bowie, Lou Reed and members of The Who, Cheap Trick, Foreigner, Toto, Journey, The Ramones and dozens more, the Hit Men have become a supergroup unlike any other. What the Wrecking Crew meant to the pop music revolution of the ‘60s, the Hit Men have meant to some of the most indelible hits of the ‘70s, ‘80s and beyond. It’s only now that the evolution of the Hit Men’s story – fueled, in part, by their countless first-hand experiences as eyewitnesses to rock history – has become a revelation. With an eye on the Hit Men’s 10th anniversary fast approaching, the band decided to start revealing more of the seemingly countless classic tracks connected with the five guys who comprise this unique group of musicians. From transistor radios, vinyl, eight-track tapes and cassettes to the Sony Walkman, CDs, digital downloads and the Apple iPod, the Hit Men — also Jimmy Ryan (lead guitar/vocals and Carly Simon’s longtime musical director) and Russ Velazquez (vocalist/keyboardist/percussionist) — have seen and heard it all. And they have the stories to go with it! 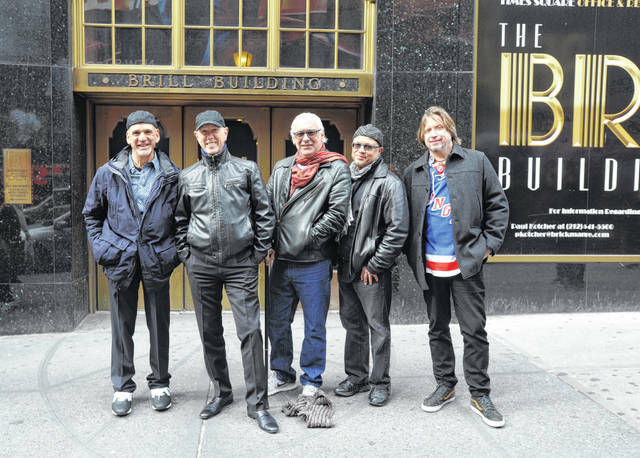 https://www.sidneydailynews.com/wp-content/uploads/sites/47/2019/03/web1_The-Hit-Men_BrillBldg_credit-Bobby-Bank.jpgThe Hit Men will perform in New Bremen, April 7.